How do I use Populi to track clinical and/or attendance hours? If your school uses clinical and/or attendance hours, you can use Populi to track them for your students. First, you contact Populi to enable them for your school. Then, you set up your degrees and courses to use them. You keep track of them using the course roster. As you track them, they become available for your review in various reports, as well as on student transcripts and degree audits. Your school may refer to these items as clock hours. If that's so, read this guide to see how to use clinical or attendance hours in such a way to reflect your usage of clock hours. There's a good chance that your school was set up to use clinical or attendance hours during implementation. In case your school needs to get started with these features midstream, as it were, contact Populi Support by opening a support request or emailing us at support@populi.co. Tell us you'd like to enable clinical and/or attendance hours. It'll take us about ten seconds (after reading your request, that is) to flip the switch and you'll be good to go. Once enabled, you can start setting up how your school uses clinical or attendance hours. To use clinical hours, you'll need to set up your programs, degrees, and courses to specify how they're used at your school. To use attendance hours, you'll only need to manage them for individual students on course rosters. Other than the clinical hours calculation setting (see below), there's no specific setup required. If you've enabled both, go to Academics > Settings > General and select how you wish clinical hours to be calculated. You can set them up to be treated like academic hours or use them as you would attendance hours. If you treat them like academic hours, then the student earns 30.00 hours when she passes the course. If you treat them like attendance hours, you'll have the option to calculate student attendance as clinical hours. For example, you have 20 meeting times, each 1.5 hours long. A student is marked present at 18 of those. She therefore earns 27 clinical hours (18 meeting times X 1.5 hours per meeting). For the program's Units, you must select hours. Check if you wish to include clinical hours in the calculations that determine class standings in this program. Click Enable Clinical Hours and check the box. 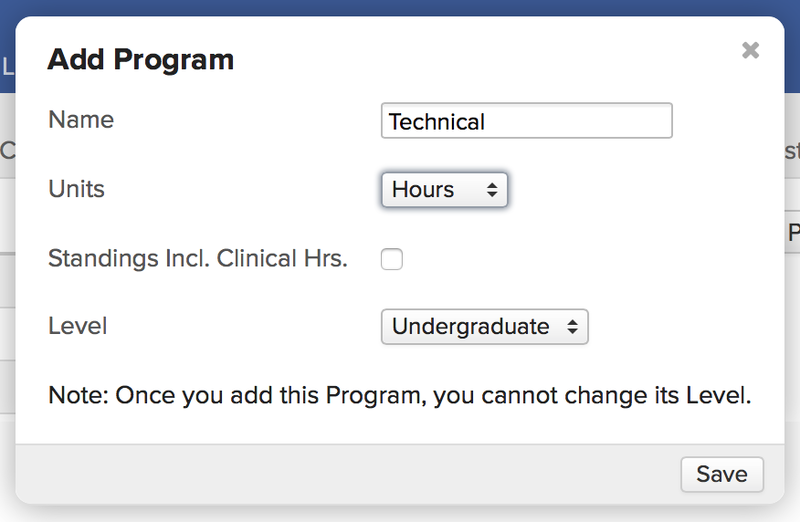 If you set clinical hours to be treated like academic hours, a new Clinical Hours field will appear up by the Hours field; scroll up to it and click it. Enter the total possible number of clinical hours a student can earn if he participates in all aspects of this course. You can also change these fields on a course instance's Info view. You can use the degree audit to track your students' fulfillment of your degrees' clinical hours requirements (see below). To prepare for that, create course groups for which you can later create clinical or attendance hour requirements. For such course groups, make sure that you do not mix clinical-hours courses with other types of courses—doing so will help you keep the requirements straight in the degree audit. You can include clinical and/or attendance hours in both general degree requirements and degree course requirements. Follow the instructions for setting up degree requirements. In general requirements, you can specify cumulative clinical or attendance hours. 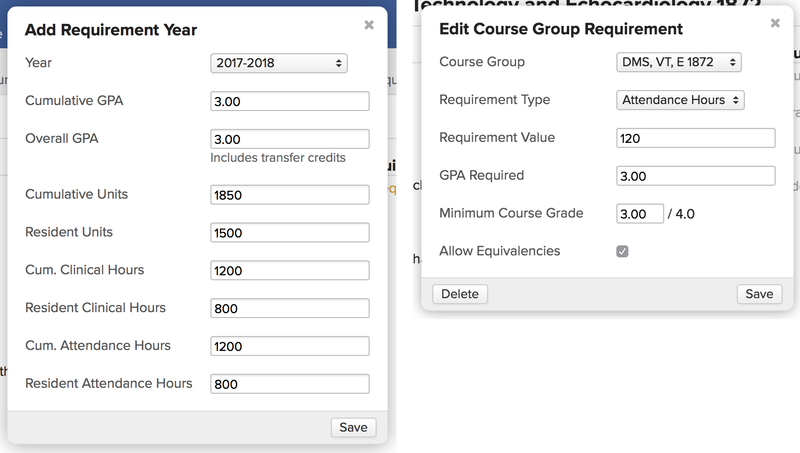 In degree course requirements, select the course groups you just created for this purpose and choose clinical or attendance hours as the requirement type. If clinical hours are treated like regular hours, then students who pass a course will earn all of the clinical hours listed for the course. When you take attendance for a meeting time, you'll see checkboxes under the Info panel asking whether to include this meeting time's attendance in the clinical/attendance hours calculations. Select whether to do so. Take attendance as you normally would. To see a running tally of how many hours the student is earning for the course, go to the course roster and look at the columns for Attnd. Hrs. and/or Clinical Hrs..
You can change these by clicking edit next to Students. This opens up the fields for editing. The student will earn however many hours as are shown on the roster at the time that he is finalized for the course. You can also view and edit clinical/attendance hours on the student course summary in the right column under Info. Student transcripts and degree audits will keep track of clinical and attendance hours just as they do with other academic stats. You will also be able to use clinical and attendance hours as reporting criteria in the Data Slicer.